In 1263 the ancestor of Clan Mackenzie saved King Alexander III from being gored by a stag with a single arrow. The grateful King granted him the right to bear a stag’s head in his coat of arms, with the motto ‘Help the King’ (Cuidich ‘ N Righ, in the Gaelic language). 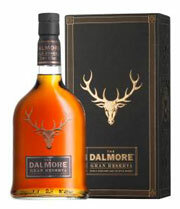 The Dalmore Distillery was long owned by the Mackenzie family, and every bottle of The Dalmore is adorned with this noble emblem: a stag’s head, with twelve points to its antlers, signifying a ‘royal’. A reminder of our heroic past and an inspiration for all who taste our Single Highland Malt. Nobody knows for certain what determines the character of malt whisky. It used to be thought that the water was the key. Certainly, the site of Dalmore Distillery was chosen to take advantage of the cold, clear waters of Loch Kildermorie, which local illicit distillers believed had mystical properties long before the legal distillery opened in the 1830s. The quality of the barley is essential, and that grown in the rich coastal soils of Ross-shire and the Black Isle, adjacent to the distillery, is second to none for making whisky. The very name ‘Dalmore’ means ‘big meadow’. The only other ingredient is yeast, and here again, Dalmore is exceptional in having developed a single strain of yeast which produces an unusually rich and fruity ‘beer’ from which the spirit is distilled. 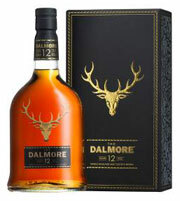 The Dalmore 12 Year Old The exceptional richness of The Dalmore spirit benefits from slightly longer maturation than is typically practised in Scotland. So our youngest expression is bottled only after twelve years, rather than the more usual ten. Our Master Blender, with some four decades of expertise, has discovered that the complex spirit from our stills is too rich to be tamed by a single style of cask. He favours fusing together the sweet, vanilla rich whiskies from ex bourbon barrels with the aromatic, spicy and dried fruits characters from sherry casks from Spain. In this, our entry level expression we have sought balance and richness by selecting malts in a 50:50 recipe - 50% from ex bourbon barrels and 50% from ex sherry butts. The Dalmore Gran Reserva The whiskies selected for this rich and robust whisky are selected as the most intense expressions of our craft and our master distiller selects the deepest, richest and most aromatic of whiskies. 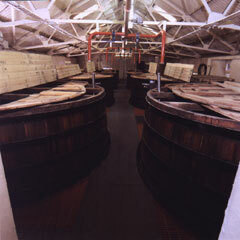 After careful selection, the whisky is returned to wood for around six months to further slumber, marry and harmonise. Typically drawing samples from casks ranging in age from 10 to 15 years of age we choose a selection where the sherry cask proportion is increased to around 60%, delivering an intense experience with a sweet, vanilla finish. The Dalmore 15 Year Old We believe that this, our new flagship expression of The Dalmore, delivers the perfect balance between spirit, wood and maturity. All single malts mature at different rates, maturing best in different styles of cask. Long experience tells us that after fifteen years the combination of citrus orange, aromatic spices, nuttiness and dried fruits from European oak sherry casks is perfectly balanced. Not just any sherry casks, but those that have been used to create some of the worlds most premium fortified wines – Amoroso, Apostles and Matusalem sherries from Gonzalez – Byass, Spain. 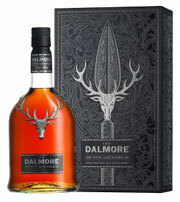 The Dalmore 1263 King ALEXANDER III A Serendipitous Discovery - In the early days, Scotch whisky was enjoyed straight from the still, without aging. Probably by accident - and certainly by the 1820s – it was discovered that if the spirit was left in a wooden cask for a year or more (preferably more!) it would lose harshness, become richer and more complex, gaining a sublime, natural golden colour. Initially used for shipping sherry, port, brandy and table wines from Europe to Scotland’s greatest ports these fundamental oak vessels were put to further use. Now the fiery Scotch spirit could win character from the wood, warmed only by the redolent cask in our cool, damp Highland warehouses. Harmonious Craftsmanship - During the 1970’s, 1980s and ‘90s, our Master Distiller, Richard Paterson, filled French wine casks, Mediterranean Madeira drums, Sherry butts from Jerez de la Frontera, Spain, Marsala barrels from Sicily, Port pipes from the Douro and sweet Bourbon barrels from Kentucky with our fledgling Dalmore spirit. These he has monitored over the passing decades until each cask has matured its contents to perfection and his experimental innovation better understood. Now comes the real art: selecting the casks so their individual characteristics work together, where the whole is greater than the sum of its parts. The goal is balance, complexity and character – a harmony of aromas and flavours. This is what you have in our 1263 King Alexander III, a celebration of our heroic past, crafted in the present and an inspiration to our exciting future. RARE AND PRESTIGE DALMORE During the mid-1960s, we began to lay down a small selection of our most exceptional Dalmore casks for extra long maturation. Our Master Distiller, who has nurtured these whiskies over the passing decades, now deems the time is right to release these extra special whiskies. They are amongst the rarest aged stocks of any distillery in Scotland – a liquid gold treasure trove for those that crave rarity, demand excellence and aspire to more – The Dalmore. 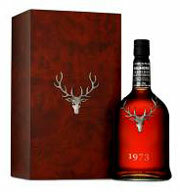 The Dalmore 1973 Cabernet Sauvignon The King of Malts meets the King of Grapes. That’s the exciting prospect we have here. Initially matured in American White Oak, the whisky has subsequently spent several years gathering complexity in Cabernet Sauvignon casks. Not ordinary casks. But those from a rare vintage Chateau Haut-Marbuzet (Saint Estephe) so their pedigree is faultless. The aim was to retain as much character of the malt as possible and finesse the flavour with hints of red berries, cherries and grape pulp. 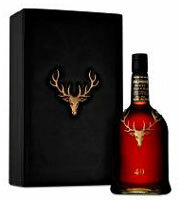 The Dalmore 40 Year Old On the 13 th February 1965 this whisky ran from the gleaming copper stills and was filled to cask to begin its long slumber. Our Master Blender has nurtured these precious casks for some four decades, using his skills to judge when the balance between wood, air and spirit was perfect for bottling. As with all maturing casks in our warehouses we lose spirit through evaporation - The Angels Share - some 2% per annum, ensuring that our loss is both the Angels and your gain. This heavenly thirst has resulted in our being able to create only 1000 bottles – a truly rare single malt. Perhaps the most important factor in making exceptional whiskies are the stills. 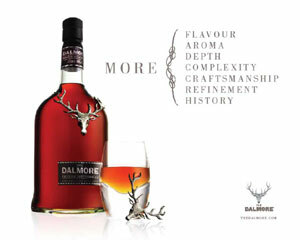 Dalmore’s stills are the oldest in the Highlands. One of them dates from as far back as 1874. Four of them (the wash stills) have flat tops, rather than the usual ‘swan necks’. This makes for a heavier, more characterful spirit. The other four (the spirit stills) have unique water-jackets around their necks, so the copper is continually cooled, making for a purer spirit. What’s more, one of the spirit stills is twice as big as the other three – another unique feature. The spirit coming from this still has a different character to that from the others – citric fruits and aromatic spices, while the smaller stills create rich and robust apple and pear drop flavours. Combined together, the result is a spirit of incomparable complexity and balance. Deep, golden mahogany in colour with orange, marmalade and aromatic spice on the nose. Elegant and rich on the palate with concentrated citrus, Oloroso sherry with hints of sweet vanilla pod. An aftertaste of great complexity. The perfect spirit to tease the palate before dining. The rich malty flavours tantalise the tongue, followed by marmalade and Christmas cake with subtle hints of roasted coffee and chocolate. It is the aroma and taste of ripe oranges and lemon peel that offers the elegant zesty top notes. A rich and harmonious single highland malt. Matured and Married in 60% Sherry wood & 40% American White Oak. A useful tip: partners well with aromatic coffees and dark chocolate after dinner. Good attack on the palate, elegant and refined. The aged Matusalem, Apostoles & Amoroso Oloroso sherry butts deliver a rich and aromatic heart full of dried spices- cloves, cinnamon and ginger. A concentrated citrus mouth-feel tantalises the middle part of your tongue with Seville orange, lemon and lime. Truly a Highland malt of great distinction. Matured 100 % in sherry casks - Matusalem, Apostoles and Amoroso. This is, quite simply, the perfect single malt, the partner for celebration. This luxurious aged malt is the result of perfect maturation in a variety of wine casks. Aged aromatic Oloroso and Madeira butts provide great backbone and a structure of crushed almonds and rich citrus fruits. The rich Port and Marsala woods add hints of wild berries and fleshy plums. Warm vanilla notes of creamy toffee from the aged Bourbon barrels combine eloquently with the majestic whispers of ripe red fruits offered up by cabernet sauvignon barriques. Complex, characterful and craved by connoisseurs. Nose – grape pukp, prunes and fudge, leading to aromas of soft fruits and honey. Taste – the classic citrus orange Dalmore signature combined with blackberries, liquorice and richly mellow, vintage red wine. Finish – long and spicy, complexed with plums and autumn berries. Restricted release of only 1000 bottles. Orange marmalade combines with Christmas pudding on the nose with hints of wood lingering in the background. Brittle toffee and bitter chocolate combine lightly on the palate with spicy orange and almonds. The finish, as expected, goes on forever. There is an old Scottish saying: “The wood makes the whisky”. By law, Scotch whisky must be matured in oak wood. We use two kinds – American oak and European oak. Each bestows different flavours to the spirit, while removing the harsher, unwanted flavours. Before they are filled with our fledgling spirit, the different kinds of cask are ‘seasoned’ with Bourbon or Oloroso sherry, which also add nuances of aroma and taste to the mellowing spirit. The transformation over time is a small miracle: it has been compared to the metamorphosis of a caterpillar into a butterfly – the cask acting as the chrysalis. When Dalmore’s Master Distiller deems that the mature whisky is ready for bottling, he selects casks of both kinds and combines them together. Unusually, he then goes a stage further, returning the mixed whisky to the wood for a further four months to allow the component whiskies to settle down, marry and harmonise. The resulting ‘liquid gold’ is thus an exceptional balance of fresh fruit flavours from the original spirit, sweet vanilla and coconut character from American oak bourbon barrels complexed with aromatic spices and dried fruit richness from the European red oak sherry butts. The Dalmore is a Northern Highland malt whisky with its distillery in the Highlands of Scotland on the shores of the Cromarty Firth and positioned opposite the Black Isle. It is a splendidly satisfying whisky with a full flavour and body, right for appreciation by the whisky enthusiast. The distillery was founded in 1839 by Alexander Mathieson and then passed to the Mackenzie family whose family crest of the "twelve pointer stag" is found on each bottle of The Dalmore. 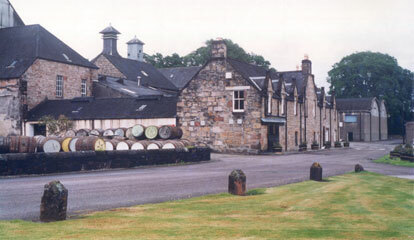 The distillery is now owned by Whyte & Mackay. 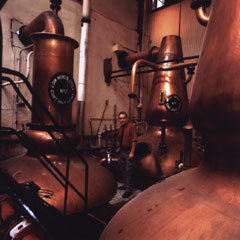 In 2006, Andrew Scott was appointed Distillery Manager. He is the youngest ever person to take the helm at the Dalmore Distillery and he was born exactly 99 years after the Mackenzies produced the first spirit at Dalmore. Admission charge £2 admission for adults. Children under 8 are not allowed in the production areas for their own safety.